The Perfect Gift For Someone You Love… Anytime Of The Year! Throughout the ages, lovers have looked for ways to prove to the world that their love is the real thing. For the past couple of decades, unknown to most Americans, “Padlocks of Love” have been placed on gates, fences and bridges, to symbolize eternal love. Couples engrave or print their initials on the locks and then throw away the key to “lock their love” forever. 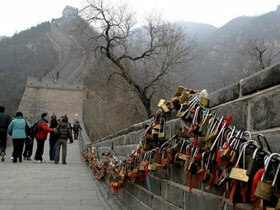 The origin of the tradition seems to trace back to China, where several “locks of love” can be found alongside the Great Wall. 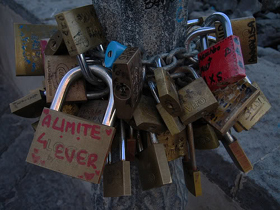 Love lock displays have sprung up in France, Germany, Guam, Hungary, Italy, Japan, Russia, and Spain. 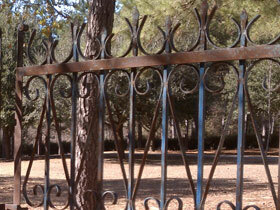 As far as we know, only a few such sites appear to be located in the United States. You’re invited to bring a padlock to place on the Gate – to acknowledge your eternal love for your spouse, family member, favorite pet, significant other, or good friend. This ancient and growing custom will symbolically lock your love ”forever”! No charge… just fun – and free! And don’t forget to bring your camera!